If how we advertise has changed, because of new technology, social media, and the active role users continue to play, shouldn’t the creative brief change, too? I mean, don’t you think that there are some fundamental questions that aren’t being asked and important insight about users that we’re missing? You might have research that tells you I’m an educated working mom who is super busy. But you probably don’t have enough research on my social currency. What if your brand lets me down in some way, do you know if I will tweet about it, blog about it or maybe share my experience on Facebook? Do you know how you want me to interact with your message? And why would you even think about recycling a traditional creative brief into a digital one? Fundamentally, their core is the same: sell something. But just because you put the file size requirements and what sites the banners for example will appear on doesn’t make it a digital brief. There are differences. I took a stab at writing a creative brief for the digital age. It’s a start, to hopefully encourage agencies to start asking more relevant questions that can hopefully generate better user experiences. 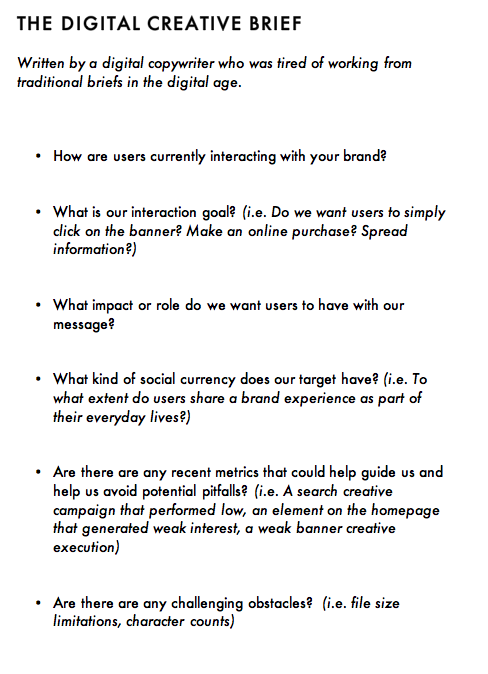 I’m not a brand planner, so I’m sure there are things that could be better or asked in a more insightful way. But I wanted to at least throw some new questions out that could potentially change the way briefs are written nowadays. Also, I found this nice slide show by Gareth Kay, Director of Digital Strategy at Goodby, Silverstein & Partners. Check it out. Update: This is sad. I just googled “digital creative brief” on 8/16/2010 and this post pulls up on the first page of the search results. Guess it’s an even bigger problem than I realized. Shouldn’t more people be talking about digital creative briefs? Every person who works in advertising should watch this. It’s long and it was filmed a year ago. Even so, it’s still a fantastic interview with AKQA’s LarsBastholm. Now that people are spending more time online, how come agencies don’t allocate their budgets more to interactive? Why do agencies spend $1,000,000 producing a television commercial and just $100,000 on a microsite? If the commercial is supposed to drive traffic online, shouldn’t the budget be distributed better? Some ad people embrace interactive. Others, not so much. It’s these others that concern me. Today, users are shaping our culture and affecting what we do as advertisers. Users are smart, creative, friendly, interesting, funny, talkative, and powerful. To not embrace the medium is to turn your back on users. And when you do that, you might as well call it a day. This is a great example of telling a story to drive people to the web.